Are these the dumbest smart headphones you'll see this year? | What Hi-Fi? Are these the dumbest smart headphones you'll see this year? 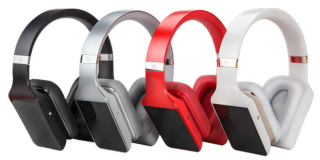 The Vinci headphones are wireless cans with a built-in AI that can can send texts, take location data, and talk to you. If you didn't have enough artificial intelligences to talk to among Siri, Google, Alexa, Cortana, or Samsung's upcoming Bixby, a Kickstarter campaign wants to put one in your headphones. Vinci is an AI that lives in this pair of wireless headphones. According to the slick, millennial-focused video, Vinci can schedule appointments, give you directions, call an Uber - all independently of your mobile phone. On the music side, the headphones have a touchscreen on the right-ear casing that gives you playback options. You swipe horizontally to switch songs, or vertically for volume. Taking the headphones off automatically pauses your music. Vinci also has dual-mic noise-reduction technology to filter out ambient sounds in two modes: "Advanced Noise Cancelling" and "Audio Transparency Mode", the second of which "transmits external noise over your music". According to the company, Vinci senses and learns from your body vitals, activities, listening habits and preferences to make intelligent, real-time recommendations such as suggesting a 'work-out' playlist when it knows you're running. Whether you find that exciting or creepy is a matter of personal taste. The headphones have up to 32GB of storage and their own operating system, built on the Android platform, that can connect to streaming services such as Spotify. Pledge prices start at $99 on its Kickstarter page. MORE: Can these bionic headphones stop you from going deaf?